The moss treatment for lawns is a necessary treatment when the moss infestation is becoming a problem and needs to be removed by scarification. A lighter moss control treatment is also included with the regular treatment package to keep any light moss under control before it becomes a problem, but this specific treatment tackles heavy moss infestations. This specific moss treatment is more commonly applied prior to lawn regeneration work, so that the existing moss is brought under control and can be removed a lot more easily. A moss control treatment will only tackle existing moss and will not prevent it from returning like a herbicide. It should always be undertaken as part of a lawn regeneration or a long term lawn improvement programme. The reason why moss has infested a lawn should always be tackled to prevent it from returning. Control of moss makes complete removal much easier. Also gives the grass a dark green colour. Helps to toughen the grass. The heavy moss control treatment will turn any areas containing moss black, which can be a visually striking, but is quite normal. This maybe a big issue in lawns that contains a great deal of moss, but the colour would only be there until the regeneration work starts. Moss control treatment is not a complete solution to a moss problem. A lawn regeneration or long term plan should be in place to prevent its return. The reason for the moss ingress should be tackled to prevent it’s return after removal. A heavy moss treatment is applied in February, March or April or in August, September or early October. The moss control treatment works best under damp conditions. The very best conditions are treating in calm conditions during a damp conditions. As long as it is not hot sunshine or gale force then winds a moss control can be effectively applied. There is no preparation needed before a heavy moss treatment can be applied, although it would be beneficial if all the leaves are removed from the lawn beforehand to enable all moss to be reached. None of the standard treatments produce any waste that the customer needs to dispose of. 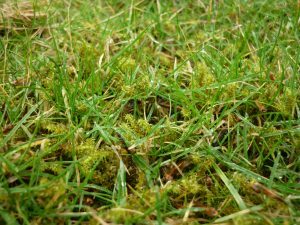 If the moss is thick on your lawn, a lawn regeneration treatment or a long term moss control plan should follow a heavy moss treatment. Has moss taken over your lawn?